The US Gulf market for granular urea has witnessed a sharp decline of up to $20ps ton over the last two weeks. With spring demand yet to surface, negative market signs in the international market have weighed heavily on sentiment in the US. 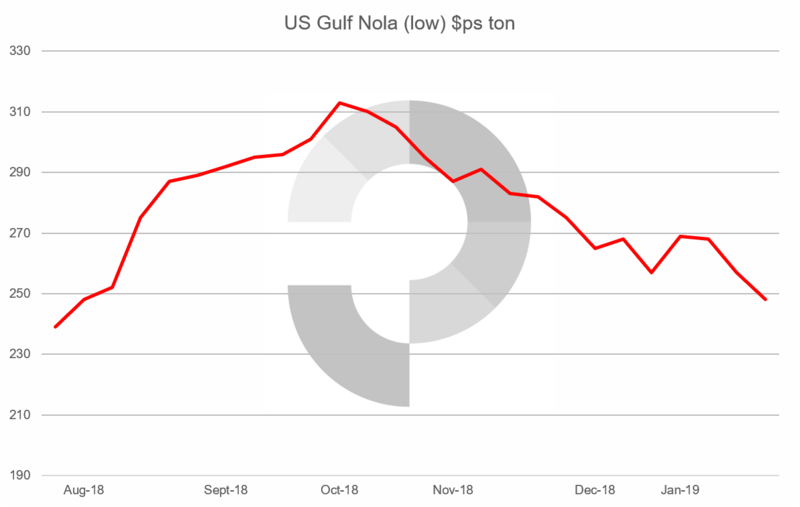 Prices declined to below $250ps ton fob Nola for the first time in five months last week amid a flurry of activity that saw 40-50,000 short tons’ worth of barge trades getting done. Several sales were concluded from vessels arriving in February and March with domestic suppliers and distributors active on the buy-side. On the supply-side, the key question going forward is to what extent current negative international sentiment will force urea shipments on the US market. In Q1 2016, 3m. tonnes of urea arrived in the US with 2m. tonnes arriving in Q1 2017. At present, the Q1 import line-up for the US Gulf appears lighter than last year, although this is in part offset by the final round of capacity additions in the USA. However, this situation could change quickly if non-US markets fail to absorb international supply in February/March. If this proves to be the case, further spot tonnage will no doubt be directed at the US from the Baltic and North Africa. This in addition to regular contract shipments from the Middle East, Russia and Trinidad. While the international market is weaker, current US Gulf barge values, reflecting $270pt cfr, offer the lowest netbacks of any major importing region. This has generally held back the inflow of spot tonnage of late. However, if other markets do not open up, the US will be attractive for producers and traders as it does offer considerable liquidity versus other areas – barges can always be sold. With regard to timing for the spring season, sailing times from key exporters, including Nigeria and North Africa are around 15 days, implying the import-line up for February and March could build quickly if the USA is the only viable outlet for large volumes. In terms of US demand, as is usual the US is in the offseason at this stage. Many observers are optimistic that once spring weather arrives there will be a sharp uptick in end-user demand, especially if improved corn acreage forecasts look set to be realised. Further, ammonia application in the fall was poor and there is an expectation that the latest round of cold weather will also limit spring application of this product. This, in turn, could bolster demand for urea and UAN. Yet, while the weather is poor and river logistics difficult, current demand is limited to those prepared to take long positions at today’s prices.